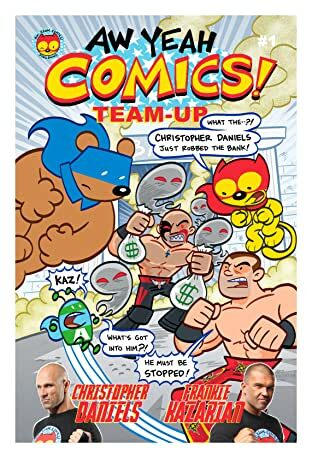 AW YEAH COMICS presents, in conjunction with RING OF HONOR Wrestling... the mini-series sequel to the critically acclaimed CHRISTOPER DANIELS and KAZARIAN WRESTLE AW YEAH COMICS! AW YEAH COMICS TEAM-UP! 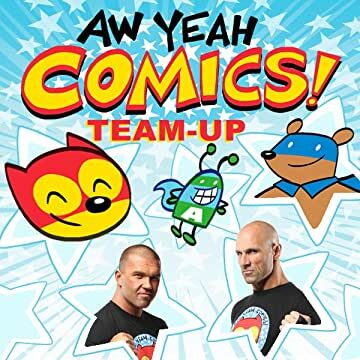 Pro-Wrestling superstars, Christopher Daniels and Frankie Kazarian return to the AW YEAH UNIVERSE! This time to TEAM-UP with our heroes...ACTION CAT, ADVENTURE BUG, and AWESOME BEAR! But what events can cause this to happen? Earth's colliding? Universes merging? An evil villain's evil plans for revenge? I bet that's it! Sounds very likely to me. I hope there is enough Inter-dimensional Transit Potion for everyone! Join us for this epic event as AW YEAH COMICS crosses over with the world of WRESTLING!